Professor Mirek Macka is ARC Future Fellow Level 3 and Professor at the School of Physical Sciences and Australian Centre for Research on Separation Science at the University of Tasmania in Hobart, Australia. His research in fundamental and practical aspects of analytical science includes primarily electromigration and chromatographic separation methods in liquid phase, detection methods, utilisation of solid state light sources in chemistry, miniaturisation of analytical instrumentation, portable and remote analysis, monolithic stationary phases, and computer-based modelling and dynamic simulations. He is author of over 170 ISI indexed papers with more than 4,000 citations, h‑index 33, and an average journal impact factor of 3.5. Mirek completed his RNDr. at the Masaryk University in Brno in 1981. He worked as research scientist in pharma industry in the Czech Republic (Lachema a.s.) and later in Switzerland (Lonza AG). After 1990 he decided for a career change to academia, and after a short stint at the Institute of Analytical Chemistry, Academy of Sciences of the Czech Republic, in Brno in 1992, he headed for Australia in 1994, where he completed his PhD in chemistry at the University of Tasmania in 1997. Professor Macka has held a series of competitive research fellowships, including ARC Research Fellow 2000-2005, EC Marie Curie Excellence Grant and Fellowship 2006-2010 (Dublin City University, Dublin, Ireland), and his current ARC Future Fellowship. His international standing is reflected in his appointments to advisory editorial boards of one national and four international scientific journals, the board of Associate Directors of the Californian Separation Science Society (CASSS), and he is a Fellow of the Royal Australian Chemical Institute (RACI). Mirek speaks 6 languages: Czech (native); English, German (daily use, fluent incl. writing); Russian (High school leaving exam); Italian (private studies since 1988); Slovak (used in then Czechoslovakia). He has basic or passive knowledge of: Latin (High school); French (CEFR A1.1); Spanish; Polish; and Portuguese. 2006 -2010: Management of the MC Excellence grant building up; and management of a research group in every respect. Mirek's research philosophy is in crossing boundaries between disciplines and between areas of fundamental or applied research, and in utilising at a maximum modern high-tech-low-$ 'smart gadgets'. Mirek's list of collaborators includes scientists from USA, Canada, EU, Switzerland, China, and Thailand. The projects are positioned in areas of separation and detection science, with focus on portable and on-site analysis. 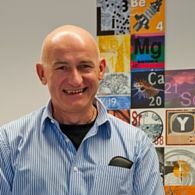 Mirek's publications span over wide areas of fundamental and applied analytical science, with most in areas of separation techniques (both chromatography and electromigration techniques) and detection science, with focus on solid state light sources and light emitting diodes as light sources of 21st century for miniaturised and portable analysis. Concerns about water contamination by heavy metals is currently addressed by chemical analysis relying on sophisticated but costly instrumentation and laboratory based analysis. Therefore the demand for low-cost, rapid, portable, and on-site analysis of natural waters is very high but not satisfactorily covered. Among the analytical approaches with low-cost, rapid and portability potential, microfluidic lab-on-a-chip devices have been explored for portable analysis and among them microfluidic paper-based analytical devices (PADs) have been gaining attention due to their unique advantages. PADs are low-cost, portable, easy-to-use, and disposable analytical devices which are usually fabricated simply by creating confined hydrophilic capillary channels on a piece of paper using wax printing or the other methods. This project will build on the investigation of PADs for instrument-free monitoring of a range of heavy metals in natural water samples particularly from the local Derwent river area. Rarely in the field of separation science is a completely new separation technology proposed. However, this is thecase herein, where the combination of fibre based electrofluidics and ambient ionisation mass spectrometry isproposed. Fibre based electrophoresis is a novel separation technology which provides considerable benefits interms of costs, simplicity and speed to pre-MS analyses. For the first time in this research the fibre is to be usedsimultaneously as the ionisation platform for ambient mass spectrometry, uniquely combining the process ofseparation and ionisation in a portable and flexible platform. The developed technology will provide significant newcapability in bioanalysis, proteomics and rapid clinical diagnostics. This project will develop the next generation of hyphenated microfluidic chip liquid chromatographyinductively coupled plasmamass spectrometer (chipLC-ICP-MS) for metallomics. We will develop aninterface to efficiently couple a chipLC system with an ICP-MS. A pneumatically-assisted nebuliser will be integrated within the ChipLC. This configuration will be superior to current nano-LCICP-MS instruments, notably by eliminating complicated, tedious capillary connectors. Incorporating 2 columns in chip configurations will enable multidimensional liquid chromatography separations. Outcomes will include a robust, highly sensitive and easy-to-use instrument for biological applications and Australian leadership in metallomic research. Traditional light source technologies up to 200 years old cannot support 21st century science. Solid state light sources offer unparalleled advantages for portable and remote analysis where the devices must be small, lightweight, robust, and have low power consumption. The development of specialised instrumentation for miniaturised portable devices within the context of the involved chemistry is proposed in each of the two focus areas: (i) Bio-imaging: Imaging and detection in biomedical screening, diagnostics and analysis with time resolved fluorescence using light-emitting diodes and quantum dot nanopaticle fluorophores; and (ii) Microfluidics Rapid and colour-multiplexed heaters and actuators for microfluidic-chip based devices. Mirek has supervised in total over 60 students and postdoctoral fellows. He is currently looking for a highly motivated PhD candidate for a project in computer based numerical simulations and modelling of phenomena in areas of separation science (more specific information on enquiry).